We have designed a target controller system which combines high technology design with ultra low pricing. 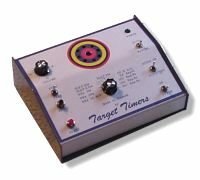 This system has been designed to turn red and green signal lights mounted on the targets on and off as required for timing. It could also be used to control turning target systems. Timing is done by an on board micro controller. Audio out put jack, which can be used to feed the voice commands into a PA system. External DPDT relay for controlling the target system. Contact rating is 15 Amp. Can also be operated of a 12 volt battery . Remote start/reset switch is available but optional.